Installer device for wind weighted tarps, easy to use. 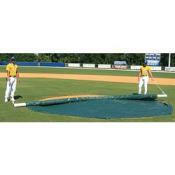 This device allows two people to cover a mound in less that 30 Seconds! PVC-Aluminum pipe desing with handle at each end for carrying and a second handle at end of 5' stainless steel aircraft cable for pulling. 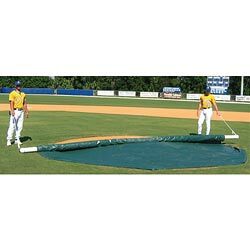 Makes tarp storage, installation, and take-up a breeze. Choose according to the size tarp you have.